Small or large, wet or dry, our water attractions never fail to entertain. A must see and try is our new Balloon Wars… water balloon fighting at its greatest. For the little tikes, The Soaker slide, Aqua Combo, and Kiddie Car Wash are perfect for the preschool age group (no pooling water in some attractions). 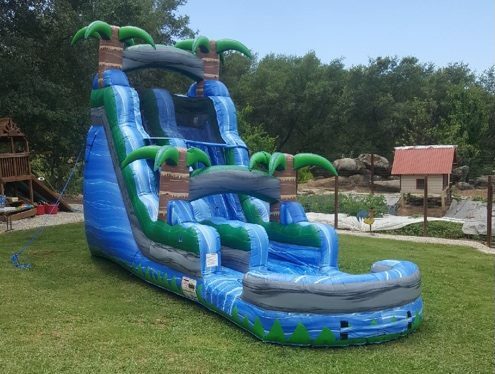 For the older kids, The Corkscrew, Aqua Extreme, Screamer Extreme and Slip n Slide (one and two lanes available) fit the bill. Water restrictions ? …. No need to worry as we have recycling and misting systems to minimize wasting of water. 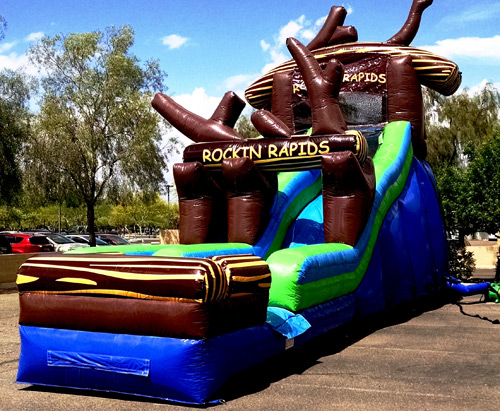 You’ll never be up the creek without a paddle on our Rockin’ Rapids™ Water Slide! 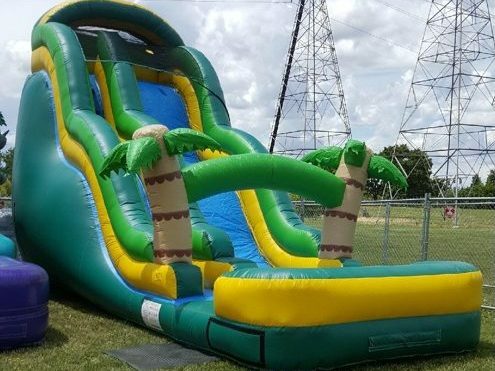 This awesome inflatable water slide is great for birthday parties, company picnics, fundraisers, school festivals and corporate events. Ahoy matey! Your crew will go overboard for the awesome Adventure Galley slide. 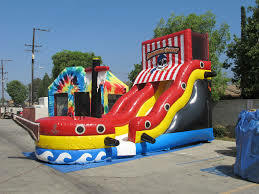 This bright, colorful slide is designed to resemble a pirate ship with a mast complete with two flags, a prow on the front and waves, portholes and anchors all along the sides. The platform is encased in mesh for safety and has a red and white striped cover featuring a pirate skull and crossbones! 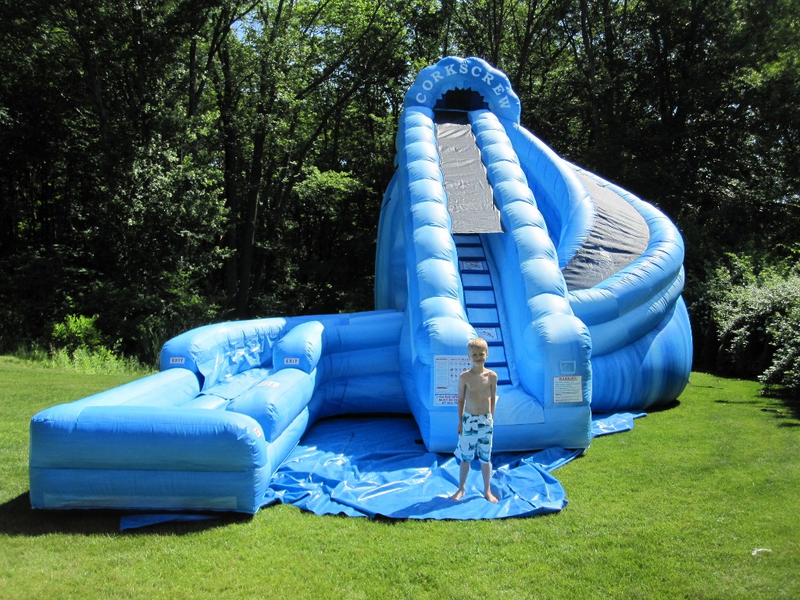 So get all your shipmates on board for a high-seas high-fun adventure with the Adventure Galley Inflatable Slide. The Tropical Wave Slide is one of our newest water attractions! 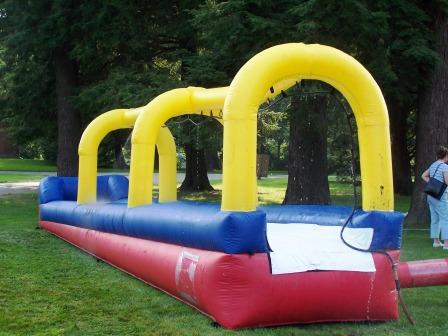 This slide is a great addition to any type of event you are planning and suitable for all ages. The Blue Crush is one of our newest water attractions! This slide is a great addition to any type of event you are planning and suitable for all ages. Climb the rugged terrain of logs, boulders and trees as you go for the ride of your life on the Log Jammer! 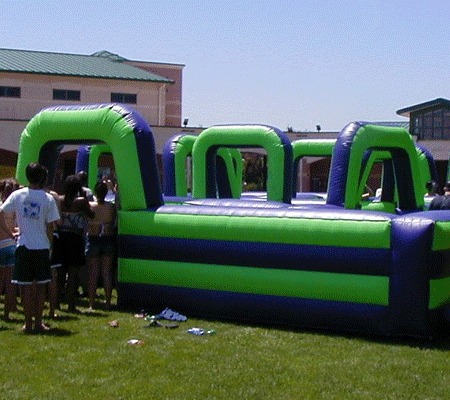 This 27′ tall giant slide has dual lanes for high volume traffic and can be used wet or dry. The Log Jammer features a large bounce area beneath the giant slide and will accommodate kids as well as adults. 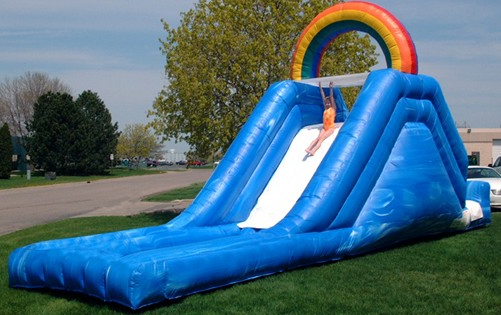 This giant slide is perfect for festivals, school carnivals and corporate functions. 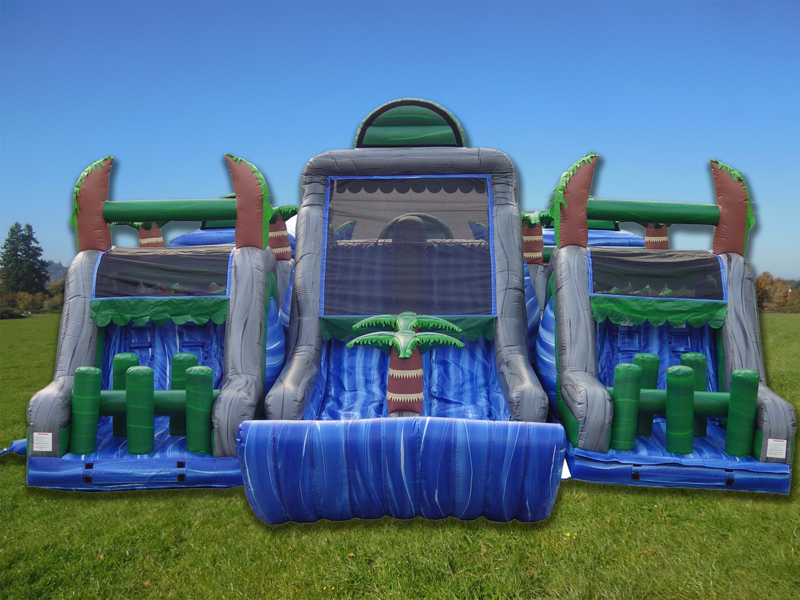 Are you looking for a fun tropical themed obstacle for your next party or event? Race your buddy through obstacles, tunnels, small climbing walls, and much more! The 3 in 1 Aqua Combo is a must have for your younger children. 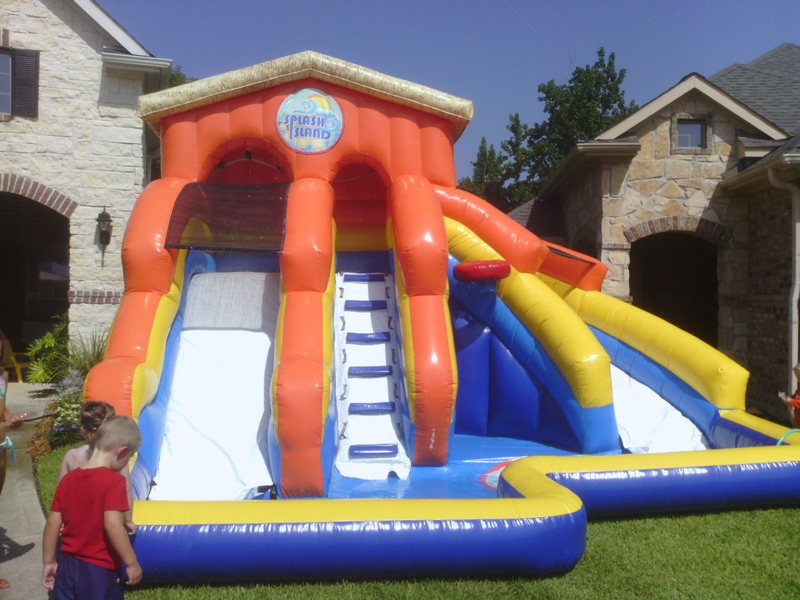 This combo can be used wet or dry and features a large bounce area with a basketball hoop, climbing structure and slide. This combo has a no-pooling water feature. Great for birthday’s, corporate parties or festivals! Choose a theme from Dora, Sponge Bob, Noah’s Ark, Sports or Princess. A new spin on an old time favorite; the Double lane Slip n’ Slide! No one can resist this Dual Lane Slip N Slide especially on a hot day! Get your friends, family or neighbors together for a race down memory lane. The Screamer Extreme Slide will make your guests Scream for more wet and wild fun! 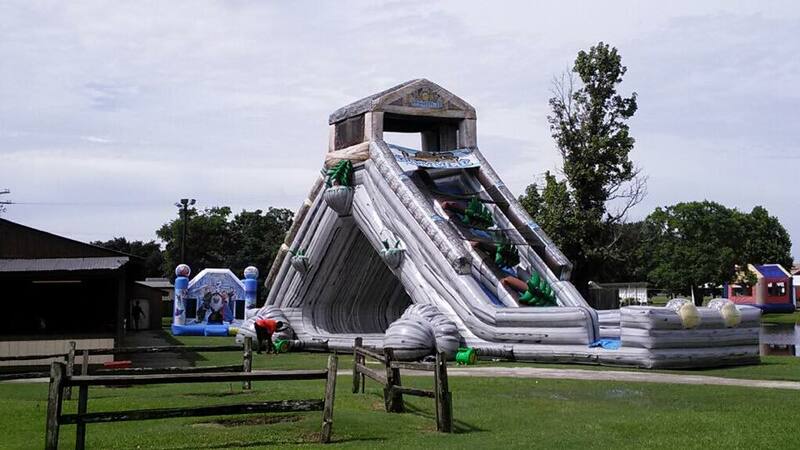 This slide is a great addition to any type of event you are planning and can be used wet or dry! Suitable for all ages including adults, for a guaranteed exciting time. Not your ordinary water slide! 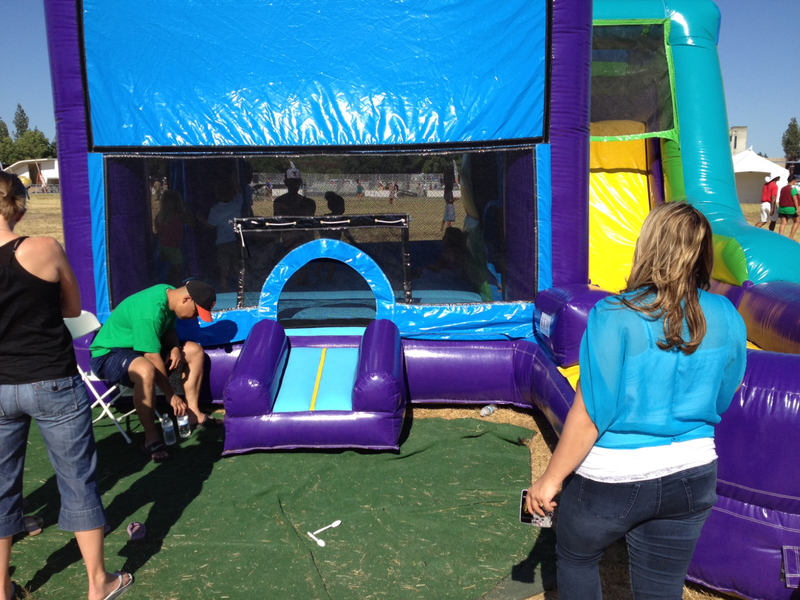 Twist and turn as you slide down this amazing 22‘ slide that can be used wet or dry, complete with tunnel. We have all been through a car wash, well why not rent the Kiddie Car Wash for your next event. Similar to a car wash, this attraction promises hours of Good Clean Fun! This summer-time water inflatable is bound to stir up some excitement! Your kids will have an AMAZING time going through this water activity and adults like an occasional cool down on hot days too! Take sides and try not to get wet in this fun water game. Each side launches water bombs (balloons) at the opposing team. The projectiles burst in the netting, raining down water on the people underneath. 2 people per side, 4 at a time or have a buddy come join you to help launch your balloons faster and add to the fun. If your child is old enough to walk they will have a splash of a good time on this single lane slip n’ slide! 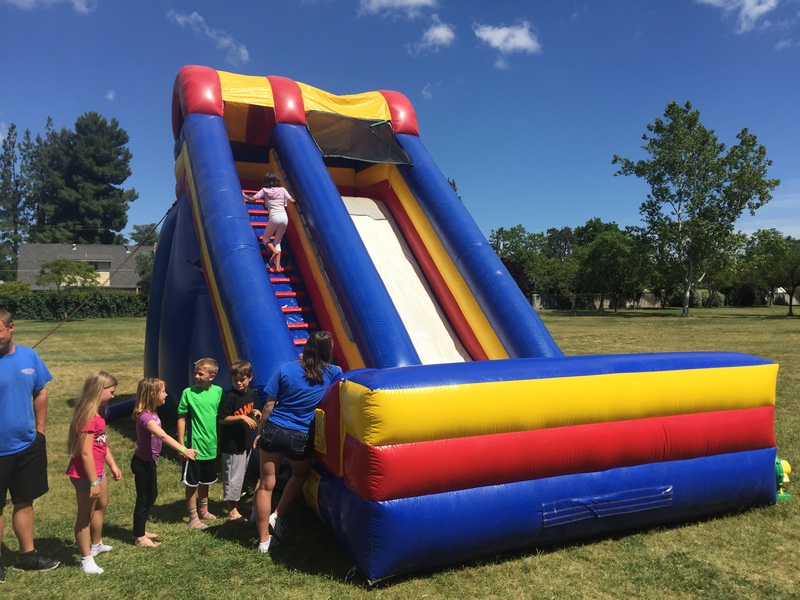 This wonderful slide is sloped to ensure a lengthy slide all 30′ to the end. 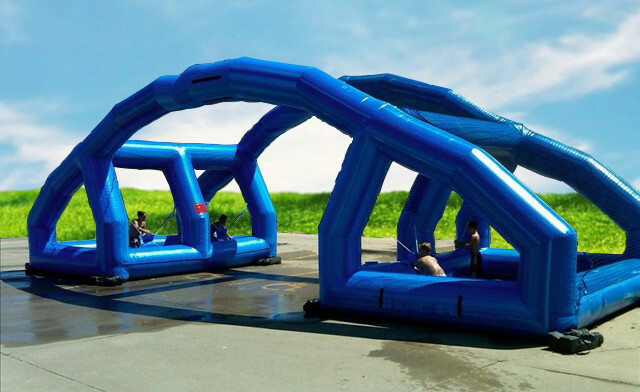 It’s single lane allows it to fit into backyards and it is also great for a children’s area at a birthday party or school function. 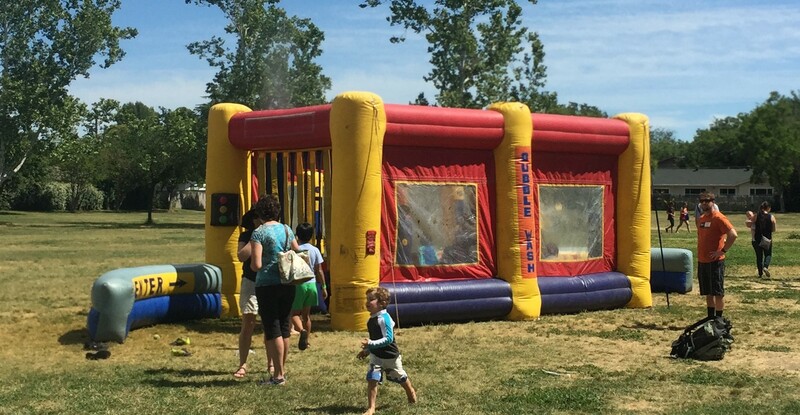 Water Tag Maze is a large style maze, complete with goggles, soaker guns and strategic fill stations for participants to continue soaking with! Up to 10 participants at a time may enjoy this attraction designed for all ages. Jump out behind walls, crouch and spray your opponent through round windows, dive behind hiding structures. Splish, Splash, Someone’s taking a bath… well not really. They are getting dunked in our dunk tank! 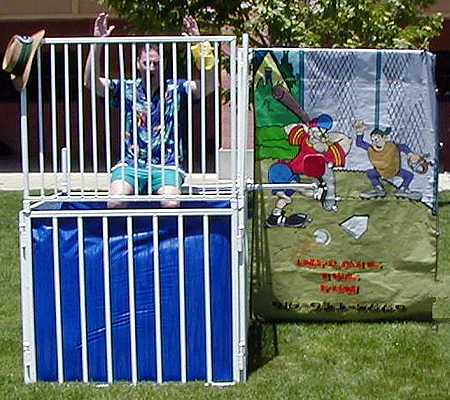 That’s right, who will be the guinea pig at your next event to take a plunge in the water below Your teacher Principal Boss Dunk Tanks have literally been around for decades! Whether you’re the dunker or the dunkee you will have a great time using this attraction. This piece is so versatile, great for festivals, carnivals or fundraiser’s. Watch their eyes light up as they climb, slide, splash and shoot hoops! Splash island features 2 different slide options to keep your little one entertained with plenty of choices of where and how to slide down. 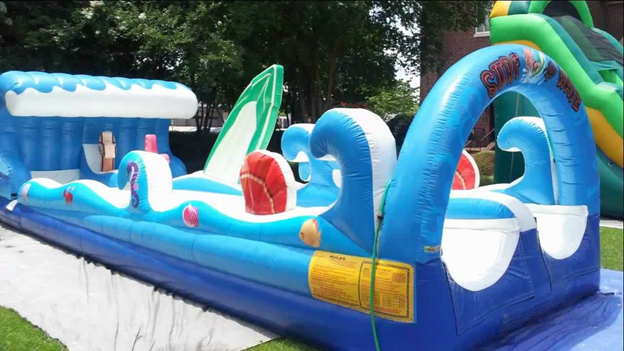 This slide can be used wet or dry and has a non-pooling water feature for the safety of little ones.